Humans are known to be social creatures, which is a factor viewed as an advantage over other animals from an evolutionary perspective. Anthropoids, unlike solitary animals, have learned to survive by living in groups, and have grown dependent on one another. Modern technology has brought the way people interact and behave to a completely different level, changing perspective and modus operandi. Social media outlets, such as Facebook and Twitter, are now used as primary platforms of communication, instead of direct and interpersonal modes of connection. The psychology behind it has caught the attention of scholarly professionals, leading to vast research avenues; in order to determine how social media outlets have contributed to narcissistic behavior in today’s society. The exposure to social media outlets as a modern method of communication has provided new gadgets to motivate selective self-presentation, which has influenced the impression of self, promoted hollow relationships, and prolonged the common narcissistic behavior seen in adolescence. It is necessary to assess the changes in the way humans interact with each other, since the time technological methods of communication have been introduced to the daily lifestyle. Even though social network outlets serve as a way of communication, these sites have turned into an active tool of exposure into the world. Facebook has consequently created a platform for display and comparison with others, whether familiar or unknown. The subjection to this specific social network results in an increase of self-esteem; age and gender not playing a relevant factor, and the utilization of a specific device not being correlated to psychosocial emotions of the users (Omolayo, Balogun, & Omole, 2013). Facebook users don’t exclusively access the network site to communicate with friends and family in order to stay in touch, and further build on the relationship. This social stage is used frequently every day to find out who has shown admiration to the private material that has been willingly disclosed, and to compare results with the attention other users have received instead. In some way, social networking sites have created a competitive environment. The desire to be noticed, over other social users, leads to a promotional sales behavior in which the product that is being sold to the world has become oneself. The influence that the subjection to Facebook has on the self-esteem of individuals that have been exposed to its medium of social network, results in self-objectification (Gonzales & Hancock, 2011). The attention sought can only be achieved by sharing relevant information that gains importance based on trends. These movements are constantly changing, and it is impossible to be part of, or follow each trend to the dot, and to morph accordingly. On the other hand, technology has made it possible for people to pretend, allowing users to easily metamorphose into different impersonations. The self-esteem is therefore built on fabricated characters, rather than the individual’s self. Hence social networks birth its effects on psychological procedures, and technology may change human social behavior outside of the virtual playground, into the real world. 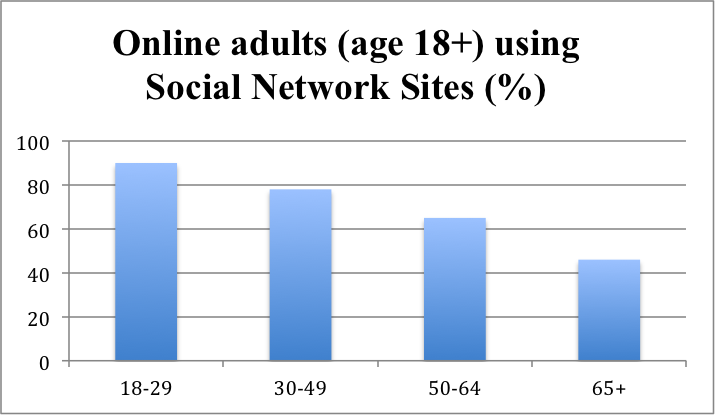 Social network sites contribute to a large piece of the daily Internet usage pie (See figure 1). The purpose of these websites is to function as an aiding tool for networking and communication, although it has transformed into a ritual necessity of sorts. 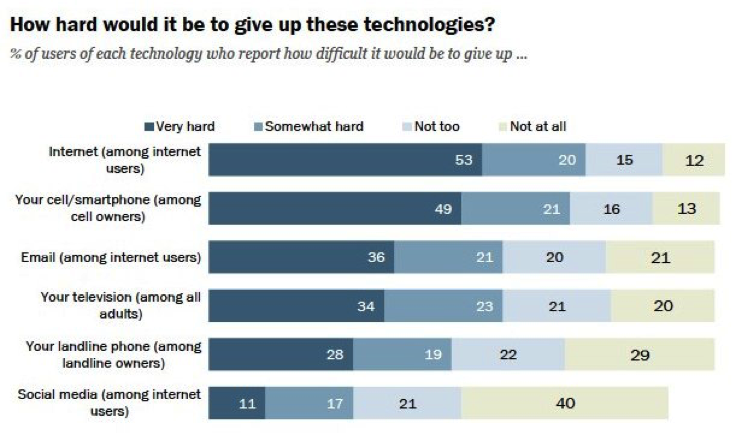 The easy access to technology, its accessibility on numerous methods of stationary and portable devices, and the exposure and integration into an every day human lifestyle, has created dependency (See figure 2). Interpersonal communication has adopted a secondary hierarchy in the way people communicate with each other, giving virtual and impersonal disclosure, a greater significance. The investment in virtual relationships, as opposed to physically tangible relationships, contributes to a catch-22 of empty friendships, and superficial interactions. A miscued sense of importance, based on collecting virtual friends on these websites for exhibition, and a specifically shaped self-presentation to the rest of the world, is raised for the sake of admiration. The behavior of social network users further results in self-centered needs, and eventually translates into narcissism (LaPorta, 2009). A correlation between self-esteem and narcissism exists. For a person to believe in personal worth, and therefore have self-esteem should not be confused with arrogance, and a prideful conduct. In furtherance to confidence, the need to constantly seek for admiration and validation is not required. Narcissistic behavior translates into the lavish engagement on personal vanity and adequacy, resulting in egotistic veneration. The use of social networking sites is positively linked with narcissism. Social media outlets “may be products of and/or contribute to a growing culture of self-centeredness” (Panek, Nardis, & Konrath, 2013, p. 2). Constant validation and admiration is sought on virtual platforms, in order to feel better with self, although it is achieved through selective self-presentation. The effects of virtual communication methods on the generations that are yet to be developed, results in an extended duration of narcissistic behavior seen in adolescence, and consequently obstructing normal maturation into adulthood (LaPorta, 2009). The insight that only interpersonal experiences can provide, in order to learn the nuances of life, is rather exchanged for a false reality in which the focus is attention and false validation. Social networking users are not only showered with plaudits on a daily basis, but have expectations to be praised without having done anything to obtain it (LaPorta, 2009). This behavior will potentially translate into a reality-shock when the online bubble breaks, and these individuals are forced into reality. Adolescents and young adults are at higher risk to form a distorted sense of self, due to the influence of technology on their development. This fragile state of mind is due to the human brain still being in development up to the age of 25. While young adults profit from the experiences that can only be gained through technological platforms, the absence of real-case scenarios needed to perform in the every day life outside of the box represents a loss. The pursuit for constant free validation may result in disappointment, and feelings of insecurity, or pride when dealing with real life situations like those at the work place. The exposure to social media outlets, and its influence on personality traits is dependent on the different types of social network sites, the populations, and the purpose these are used for. While the utilization of Twitter is linked to a narcissistic behavior, Facebook is associated with the display of selective self-presentation (Panek, Nardis, & Konrath, 2013). Social media outlets have greatly contributed to the construction, and retention of relationships with those that are not in proximity, allowing opportunities of communication otherwise not possible. On the other hand, it has influenced the needs and personality traits of human beings in which quantity is often praised over quality. Modern technology has granted access to the world that is outside, narrowing what is closest around, and most importantly forgetting about the world within. Gonzales, A. L., & Hancock, J. T. (2011). Mirror, mirror on my Facebook wall: Effects of exposure to Facebook on self-Esteem. Cyberpsychology, Behavior & Social Networking, 14(1/2), 79-83. doi:10.1089/cyber.2009.0411.